His Name Was Raoul Wallenberg: Courage, Rescue, and Mystery During World War II by Louise Borden. Raoul was born in August 1912, near Stockholm, Sweden. Because his father died from cancer before Raoul was born, his grandfather became his mentor. Gustaf Oscar Wallenberg was a man of bold ideas. From an early age, Raoul liked to read and draw and through that his parents discovered that he was colorblind. Raoul Wallenberg stood apart from his classmates because of his curiosity. His grandfather wanted him to become an independent citizen of the world so Raoul traveled to Turkey, England, and France, and found his talent for languages. Raoul studied architecture at the University of Michigan, discovering his talent in that too. After graduation, he traveled to South Africa, Palestine, Genoa, France, Athens, Egypt, and Haifa. When WWII's first shots were fired, Raoul was working in an import-export business. The War Refugee Board wanted a courageous man who spoke German or Hungarian and had been to Budapest to organize help for the Jewish people in Budapest. Raoul was the man for this job. To find out what happens to Raoul in his conquest to save the Jews, you should read this book. I give this book 4 stars out of 5 because I generally like stories about wars. Even though I knew that Raoul's fate has not been found, I was still disappointed to be in the dark about his death, which made this 1 star short of perfect. Students 8 years old and older will enjoy reading His Name was Raoul Wallenberg, especially if they enjoy war stories. Louise Borden sets up the text of His Name was Raoul Wallenberg almost like a poem which adds a touch of creativity and breaks the text into easier to read phrases. Louise Borden included fascinating facts, like "he was given no clear instructions... and no one really knew how or if he could succeed." A task is hard enough when you are given specific instructions, even harder if you don't know what to do. Raoul had the creativity to make the schutzpass, a fancy document used to put Jews under the protection of the Swedish government. Reading this book made me want to meet Raoul Wallenberg because he was courageous, even though he had a disability, color blindness. He was as cunning as a fox in tricking his foes and he was brave to ignore the consequences of being caught helping to save thousands of Jewish lives. If you read this book, you may be able to come up with a theory of Raoul's outcome but I'm sure you'll be impressed with this detailed account of this World War II hero's life. 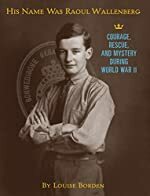 We would like to thank Houghton Mifflin Harcourt for providing a copy of His Name Was Raoul Wallenberg: Courage, Rescue, and Mystery During World War II for this review. Have you read His Name Was Raoul Wallenberg: Courage, Rescue, and Mystery During World War II? How would you rate it?